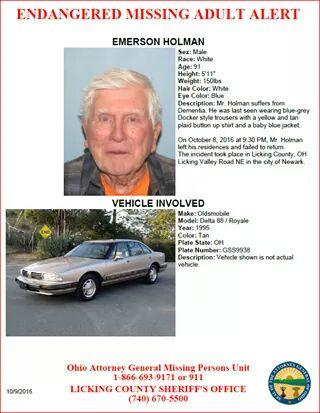 The Licking County Sheriffâ€™s Office needs your help to find a missing elderly Newark man. Captain Chris Slayman says 91-year-old Emerson Holman â€“ who is believed to have onset dementia â€“ was last seen by family Saturday evening. He is believed to be with his vehicle and was last seen in the last 24 hours in the Jacksontown/Thornville area. Captain Slayman released a picture of Emerson and his vehicle and says any help the public can provide will be appreciated.